In other words, the discovery made at Brazil naturally suggests the idea that the observed deflexion is due to the condensation of the cether around the Sun*, and although one has been an implacable enemy of any ajther at all, for the* last fifteen years, one does not hesitate to poiut out this, possibility—a last glimpse of hope, perhaps, for the banished medium. 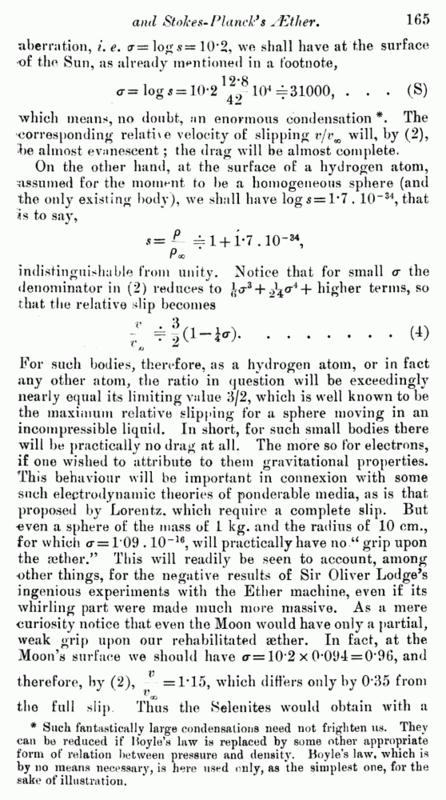 Let us imagine for the moment that Einstein had never published his debatable, though undoubtedly beautiful, new theory—not even that of 1905. 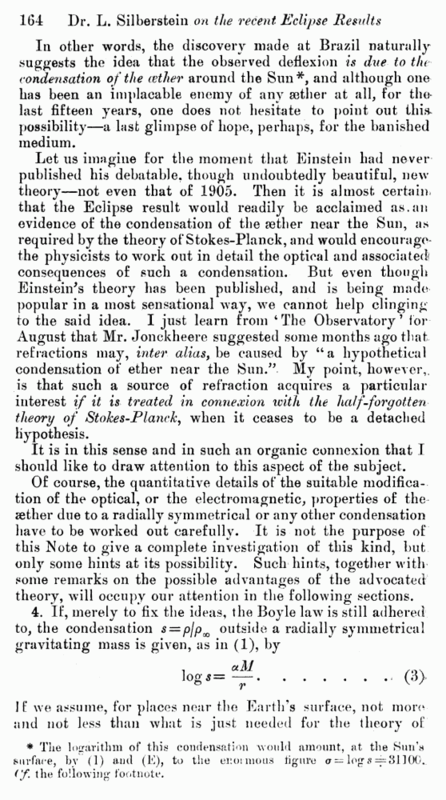 Then it is almost certain, that the Eclipse result would readily be acclaimed as.an evidence of the condensation of the aether near the Sun, as required by the theory of Stokes-Planck, and would encourage* the physicists to work out in detail the optical and associated! consequences of such a condensation. But even though Einstein's theory has been published, and is being made popular in a most sensational way, we cannot help clinging to the said idea. I just learn from 4 The Observatory ’ for August that Mr. Jonckheere suggested some months ago that refractions may, inter alias, be caused by “a hypothetical condensation of ether near the Sun.” My point, however,, is that such a source of refraction acquires a particular interest if it is treated in connexion with the half-forgotten theory of Stokes-Planck, when it ceases to be a detached hypothesis. It is in this sense and in such an organic connexion that I should like to draw attention to this aspect of the subject. Of course, the quantitative details of the suitable modification of the optical, or the electromagnetic, properties of the cether due to a radially symmetrical or any other condensation have to be worked out carefully. It is not the purpose of this Note to give a complete investigation of this kind, but only some hints at its possibility. Such hints, together with some remarks on the possible advantages of the advocated theory, will occupy our attention in the following sections. * The logarithm of this condensation would amount, at the Sun’s surface, bv (1) and (E), to the enormous figure a — log s = 81100.. (f the following footnote. which means, no doubt, an enormous condensation *. The corresponding relative velocity ot* slipping v/vw will, by (2), be almost evanescent; the drag will be almost complete. * Such fantastically large condensations need not frighten us. They can be reduced if Hoyle’s law is replaced by some other appropriate form of relation between pressure and density. Boyle’s law, which is by no means necessary, is here used only, as the simplest one, for the sake of illustration.